Sterling silver, Turquoise, and Coral (Individual stones may vary slightly). 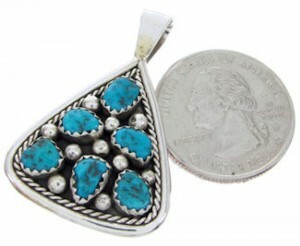 Pendant measures approximately 1-5/8" long (including bail) and 1" at widest point. If you are looking for elegance and beauty, you have found it! 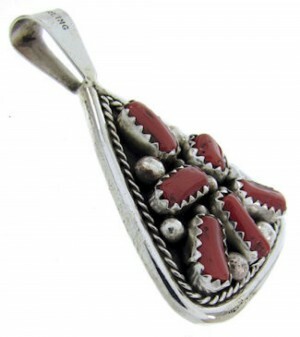 This piece of Native American jewelry is Navajo hand crafted by artist Irvin Chee, out of genuine sterling silver, along with real Corals and real Turquoise stones. The pendant is reversible it can be worn on either side, one side being Coral and the other side being Turquoise (its like having two pendants in one). A total of TWELVE stones are carefully set in hand cut bezel, while silver beads and twisted silver can be seen accenting each side of the pendant for a gorgeous finish. The pendant is stamped sterling and hallmarked.